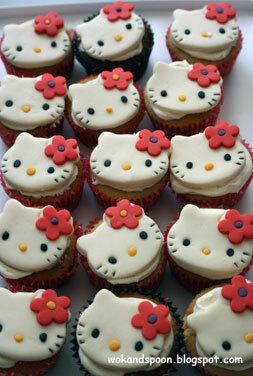 Below are lots of ideas for Hello Kitty party games, suitable for a kid's birthday party. 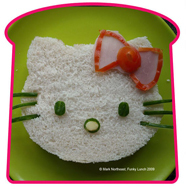 For more Hello Kitty themed party ideas, such as invitations, food & drink, decorations and styling tips, see my main Hello Kitty page. 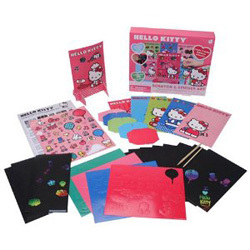 You can adapt a traditional treasure hunt for these Hello Kitty party games by printing off lots of Hello Kitty faces from the web and hiding them all around the house or garden. 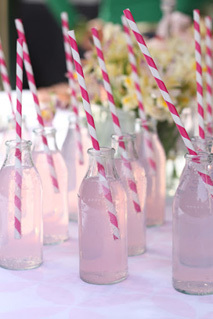 Print them in a range of different sizes and see who can find the most, then let the kid's redeem them for prizes / favors. 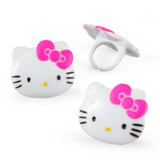 This is a variation of the playground game 'Stuck in the Mud', tailored to fit in with these Hello Kitty party games. 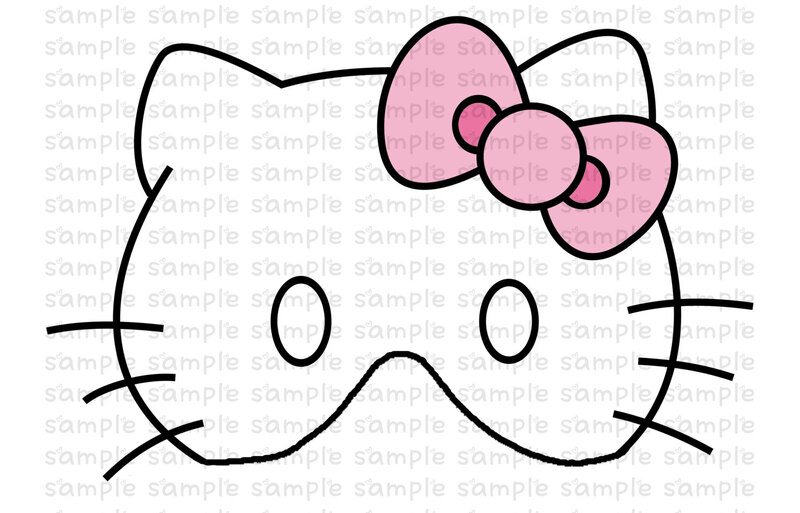 Ahead of the party, download this cheap printable Hello Kitty mask template (supplier 8) and make up enough masks for every guest. At the party, split the kids into two teams. 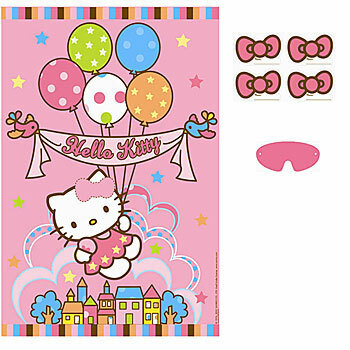 Give one team the Hello Kitty masks to wear and have the others play as themselves. Have the kids play a game of tag but when each person is caught they have to stand still with their legs open and their arms out to the sides. They can only be released and return to the game when another member of their team crawls through their legs to free them. Keep playing until one team has all the members caught. This cheap party game (select supplier 1 or 3) is a variation of 'Pin the Tail On' where the objective is to pin the bow on kitty. 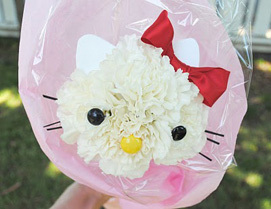 It comes with 12 bows and a blindfold. Make it more difficult by spinning the kids around a few times before they take their turn. 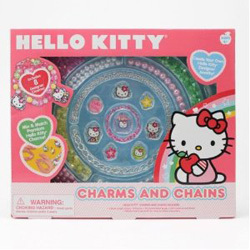 There are lots of different Hello Kitty craft kits (select supplier 3) available, such as jewellery making or art kits, which would be a good option for indoor activities. 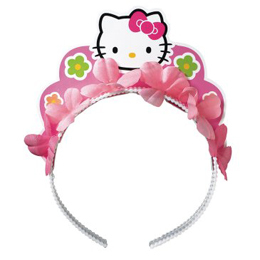 Get one of the kids to volunteer to be Kitty, and give them one of the masks to wear. Then have them sit in a large cardboard box at one end of the garden (Point B). Split the remaining kid's into two teams, Team 1 and Team 2. Team 1 goes to the opposite end of the garden (Point A), while Team 2 are positioned adjacent to Kitty in her box but several meters away. 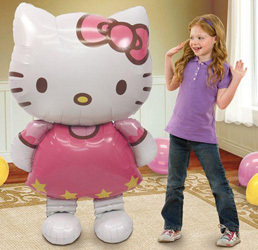 The object of the game is for Team 1 to creep slowly on tip toes from Point A to Point B without getting caught by Kitty. Team 2 meanwhile have to try to wake Kitty by throwing small bounce balls at her box. If a ball hits the box, Kitty must pop up for a few seconds. When she does, Team 1 must freeze, and if Kitty catches them moving they must return to Point A and start over again. Team 1 wins once all their players have reached Point B. You can adapt this game to just one team if you prefer, and do away with the ball throwing. Just having Kitty pop up of her own accord now and then to catch the other players moving. 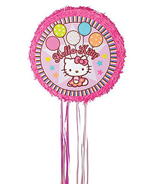 There are several different pinatas (select supplier 1) that would make a great addition to these Hello Kitty party games. 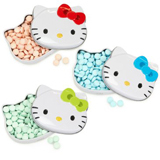 Arrange a selection of small Hello Kitty themed novelties and favors (select supplier 1) on a tray and let the kid's study them for a few minutes. Then take the tray away, remove one item, and see if they can spot what's missing. K is for Kitty, but what else? Ahead of the party, position a number of items around the room that begin with the letter K. Then see how many the kids can spot. You could have them write down their answers individually then award prizes to the top 3 winners. 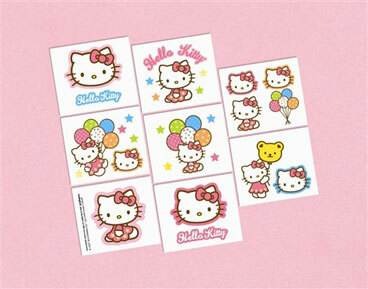 Kid's love tattoos, so pick up a pack of these Hello Kitty temporary tattoos (select supplier 1) or use them as rewards for some of the other party games. 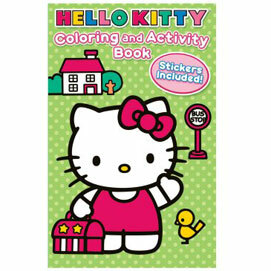 These coloring and activity books (supplier 1 or 3) are a good option to keep the kids occupied while all the guests arrive. 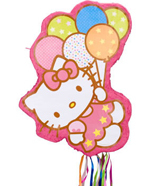 For more ideas to go with these Hello Kitty party games, such as party invitations, recipes, birthday cake tips and decorations see my main Hello Kitty page. 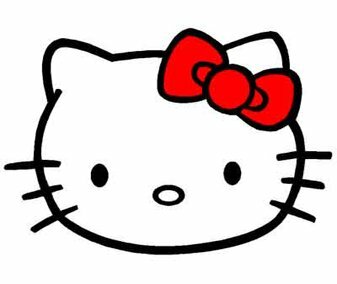 If you've found these Hello Kitty party games useful please help me to promote this site by sharing this page with others. Just click on the Facebook or Twitter buttons below. Alternatively you can click on the "Enjoy this page?" link underneath the buttons to copy the link address for this page and paste it onto your own site, blog or forum.